, an ingenious and humourous English writer, was born in London, 1663, the son of Ezekiel King, a gentleman. He was allied to the noble families of Clarendon and Rochester. From Westminster school, where he was a scholar on the foundation under the care of Dr. Busby, he was at eighteen elected to Christ-church, Oxford, and admitted a student there in Michaelmas term, 1631. 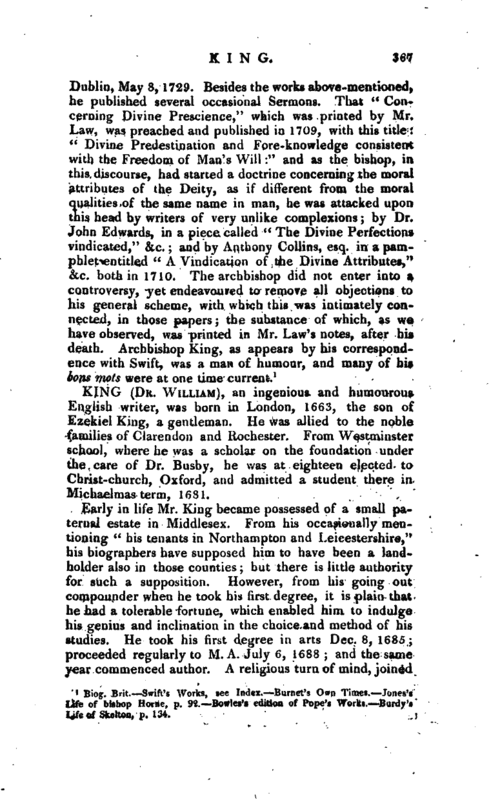 Early in life Mr. King became possessed of a small paternal estate in Middlesex. From his occasionally mentioning “his tenants in Northampton and Leicestershire,” his biographers have supposed him to have been a landholder also in those counties; but there is little authority for such a supposition. However, from his going out compounder when he took his first degree, it is plain that he had a tolerable fortune, which enabled him to indulge his genius and inclination in the choice and method of his studies. He took his first degree in arts Dec. 8, 1685; proceeded regularly to M. A. July 6, 1688; and the same year commenced author. A religious turn of mind, joined | to the warmest regard for the honour of his country, promoted him to rescue the character and name of Wickliffe, our first reformer, from the calumnies of mons. Varillas. The thing had been publicly requested also, as a proper undertaking for such as were at leisure, and would take the trouble. Mr. King, therefore, deeming himself to be thus called forth to the charge, readily entered the lists; and with a proper mixture of wit and learning, handsomely exposed the blunders of that French author, in “Reflections upon Mons. Varillas’ History of Heresy, book I. tom. I. so far as relates to English matters, more especially those of Wickliffe.” About this time, having fixed on the civil law as his profession, he entered upon that study in the university. 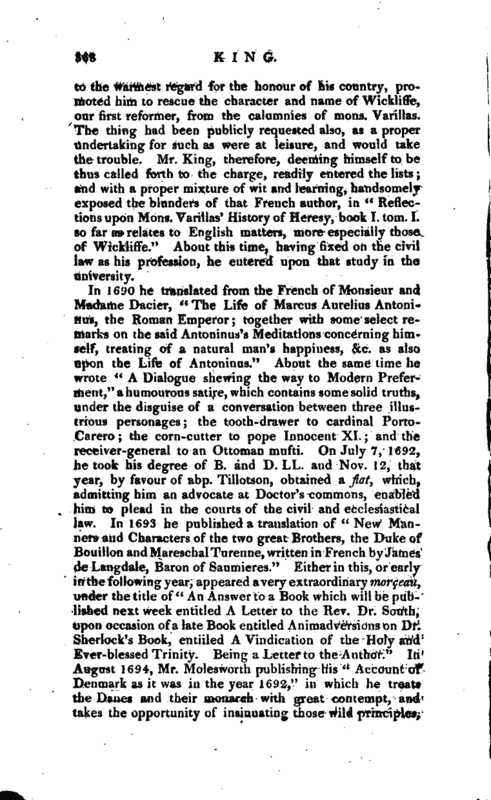 In 1690 he translated from the French of Monsieur and Madame Dacier, “The Life of Marcus Aurelius Antoninus, the Roman Emperor; together with some select remarks on the said Antoninus’s Meditations concerning himself, treating of a natural man’s happiness, &c. as also upon the Life of Antoninus.” About the same time he wrote “A Dialogue shewing the way to Modern Preferment,” a humourous satire, which contains some solid truths, under the disguise of a conversation between three illustrious personages; the tooth-drawer to cardinal PortoCarero; the corn-cutter to pope Innocent XI. ; and the receiver-general to an Ottoman mufti. On July 7, 1692, he took his degree of B. and D. LL. and Nov. 12, that year, by favour of abp. Tillotson, obtained a fat, which, admitting him an advocate at Doctor’s commons, enabled him to plead in the courts of the civil and ecclesiastical law. In 1693 he published a translation of “New Manners and Characters of the two great Brothers, the Duke of Bouillon and MareschalTurenne, written in French by James de Langdale, Baron of Saumieres.” Either in this, or early in the following year, appeared a very extraordinary mor^tau^ under the title of “An Answer to a Book which will be published next week entitled A Letter to the Rev. Dr. South, upon occasion of a late Book entitled Animadversions on Dr. Sherlock’s Book, entiiled A Vindication of the Holy and Ever-blessed Trinity. Being a Letter to the Author.” In August 1694, Mr. Molesworth publishing his “Account of Denmark as it was in the year 1692,” in which he treata the Danes and their monarch with great contempt, and takes the opportunity of insinuating those wild principles, | by which he supposes liberty to be established, and by which his adversaries suspect that all subordination and government is endangered. Dr. King therefore took up his pen once more in his country’s cause, the honour of which was thought to be blemished by that account, Mr. Scheel, the Danish minister, having presented a memorial against it. Animated with this spirit, Dr. King drew up a censure of it, which he printed in 1694, under the title of “Animadversions on the pretended Account of Denmark.” This was so much approved by prince George, consort to the princess Anne, that the doctor was soon after appointed secretary to her royal highness. It has been generally allowed that Dr. King, though he could not endure his business as an advocate, made an excellent judge in the court of delegates, as often as he was called to that bench. The fatigue, however, of a civilian’s duty was too great for his natural indolence; and he retired to his student’s place at Christ-church, to indulge his predominant attachment at better leisure. From this time, giving way to that fuga negotii so incident to the poetical race, he passed his days in the pursuit of the same ravishing images, which, being aptly moulded, came abroad in manuscript, in the form of pleasant tales and other pieces in verse, at various times, as they happened to be finished. Many of these he afterwards collected, and published, with other pieces, in his “Miscellanies.” In 1700 he published without a name, a severe satire on the credulity of sir Hans Sloane, entitled “The Transactioneer, with some of his philosophical fancies, in two dialogues.” The irony in this tract is admirable; and it must be acknowledged, notwithstanding the deservedly high character of sir Hans as a physician and a naturalist, that our author has in many places discovered the vulnerable heel of Achilles, and that his satirical observations are io general well-founded. 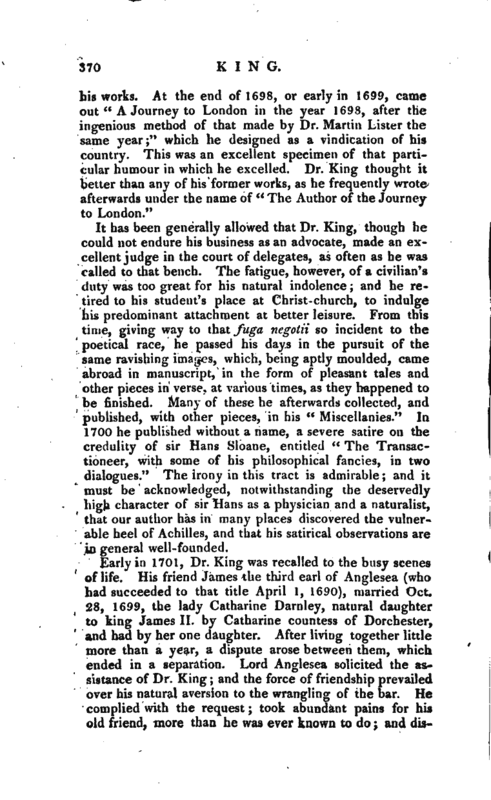 Early in 1701, Dr. King was recalled to the busy scenes of life. His friend James the third earl of Anglesea (who had succeeded to that title April 1, 1690), married Oct. 28, 1699, the lady Catharine Darnley, natural daughter to king James II. by Catharine countess of Dorchester, and had by her one daughter. After living together little more than a year, a dispute arose between them, which ended in a separation. Lord Anglesea solicited the assistance of Dr. King; and the force of friendship prevailed over his natural aversion to the wrangling of the bar. He complied with the request took abundant pains for his old friend, more than he was ever known to do and | distinguished himself so in the earl’s defence, as shewed him to have had abilities in his profession equal to any occasion that might call for them, and effectually established his reputation in the character of a civilian, as he had already done in that of a polite writer. Notwithstanding the reputation acquired by Dr. King in this cause, he never afterwards attained any striking eminence in a profession where constant assiduity and a long course of years are requisites for the acquisition of fame. Captivated by the rnuses, he neglected business, and by degrees, as is natural to such tempers, began to dread and abhor it. 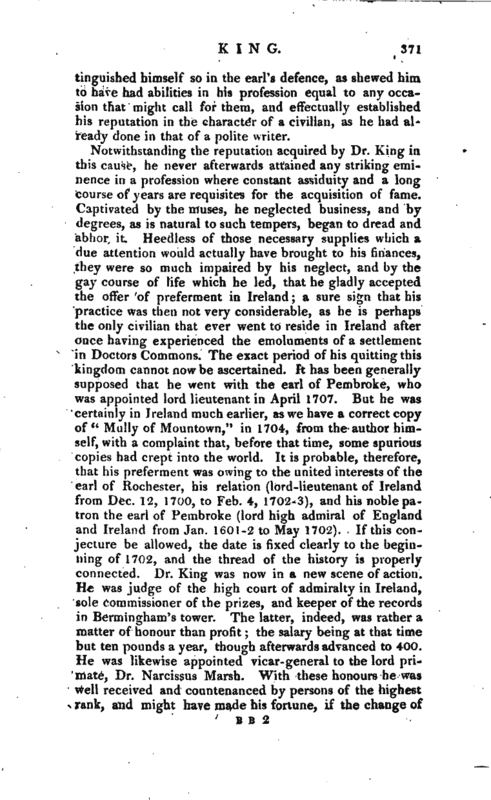 Heedless of those necessary supplies which a due attention would actually have brought to his finances, they were so much impaired by his neglect, and by the gay course of life which he led, that he gladly accepted the offer of preferment in Ireland; a sure sign that his practice was then not very considerable, as he is perhaps the only civilian that ever went to reside in Ireland after once having experienced the emoluments of a settlement in Doctors Commons. The exact period of his quitting this kingdom cannot now be ascertained. It has been generally supposed that he went with the earl of Pembroke, who was appointed lord lieutenant in April 1707. But he was certainly in Ireland much earlier, as we have a correct copy of “Mully of Mountown,” in 1704, from the author himself, with a complaint that, before that time, some spurious copies had crept into the world. It is probable, therefore, that his preferment was owing to the united interests of the earl of Rochester, his relation (lord-lieutenant of Ireland from Dec. 12, 1700, to Feb. 4, 1702-3), and his noble patron the earl of Pembroke (lord high admiral of England and Ireland from Jan. 1601-2 to May 1702). If this conjecture be allowed, the date is fixed clearly to the beginning of 1702, and the thread of the history is properly connected. Dr. King was now in a new scene of action. He was judge of the high court of admiralty in Ireland, sole commissioner of the prizes, and keeper of the records in Bermingham’s tower. The latter, indeed, was rather a matter of honour than profit; the salary being at that time but ten pounds a year, though afterwards advanced to 400. He was likewise appointed vicar-general to the lord primate, Dr. Narcissus Marsh. With these honours he was well received and countenanced by persons of the highest rank, and might have made his fortune, if the change of | climate could have wrought a change in his disposition. But so far was he from treasuring up the money in a manner thrown into his lap, that he returned to England with no other treasure than a few merry poems and humourous essays. Such indeed was his profusion, that he might have said with Virgil’s shepherd, non unquam grams arc domum mihi dextra redibat. On Nov. 25, 1708, the earl of Wharton was appointed lord lieutenant. 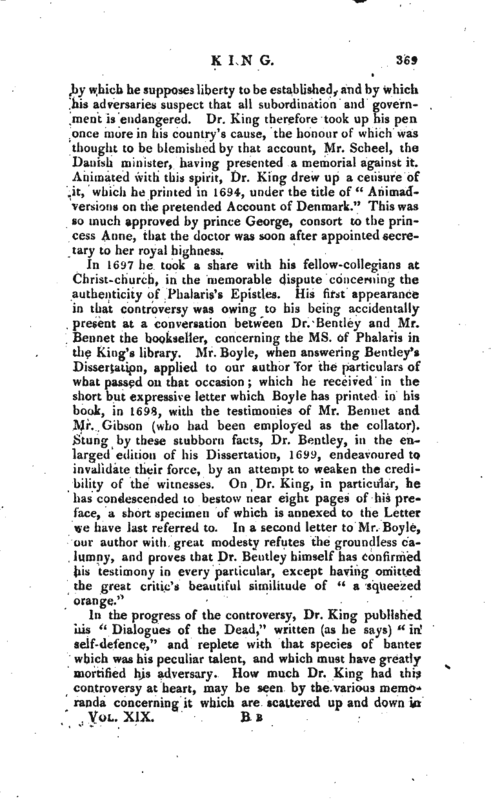 His secretary, Mr. Addison, immediately on his arrival in Ireland, was made keeper of the records; and Dr. King returned to London, where he almost immediately gave the world those admirable instances of the humour so peculiarly his own, by publishing “Useful transactions in philosophy and other sorts of Learning.” The last of these, containing “A Voyage to the Island of Cajamai in America,” is one of the severest and most humourous satires that ever was written in prose. 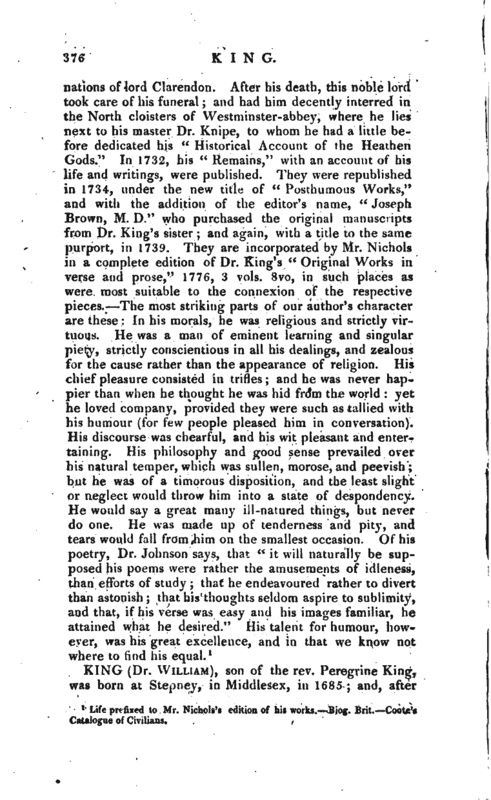 He next employed himself in finishing his “Art of Love,” with a preface containing the “Life of Ovid.” The doctor’s virtuous disposition is nowhere more remarkably distinguished than in this piece; in- which both the subject and the example so naturally lead into some less chaste images, some looser love which stands in need of a remedy. It is divided into fourteen books, most of them ending with some remarkable fable and interesting novel. In 1709 he also published, “The Art of Cookery, in imitation of Horace’s Art of Poetry; with some letters to Dr. Lister and others, occasioned principally by the title of a book published by the doctor, being the Works of Apicius Calms, concerning the soups and sauces of the ancients. 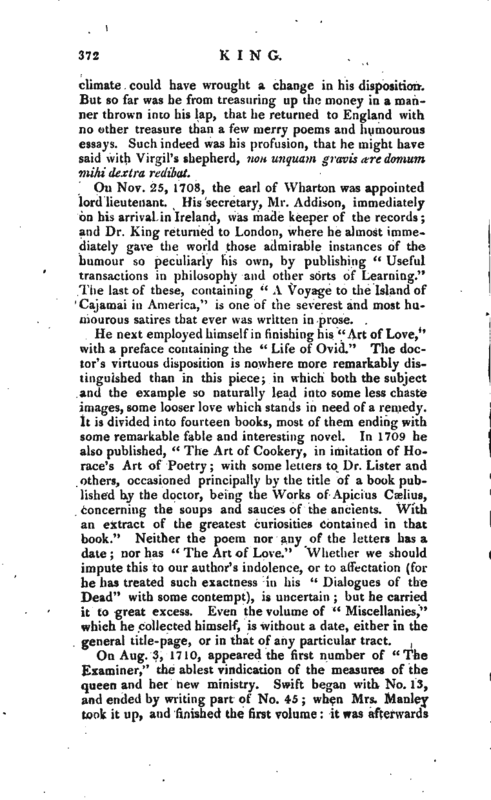 With an extract of the greatest curiosities contained in that book.” Neither the poem nor any of the letters has a date; nor has “The Art of Love.” Whether we should impute this to our author’s indolence, or to affectation (for he has treated such exactness in his “Dialogues of the Dead” with some contempt), is uncertain; but he carried it to great excess. Even the volume of “Miscellanies,” which he collected himself, is without a date, either in the general title-page, or in that of any particular tract. Dr. King was undoubtedly assisted in this severe treatise by Charles Lambe, M. A. and by Sacheverell himself; and there is good reason to believe that they were also jointly of “The Principles of Deism truly re­ presented and set in a clear light. In two dialogues between a sceptic and a deist, 1708,” 8vo; an admirable defence both of natural and revealed authors religion. This masterly composition had scarcely appeared in the world before it was followed by “Mr. Bisset’s Recantation in a letter to the Rev. 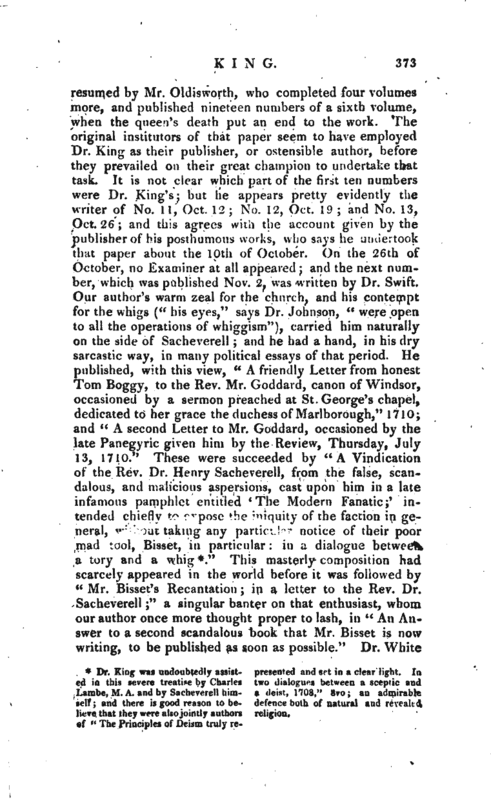 Dr. Sacheverell” a singular banter on that enthusiast, whom our author once more thought proper to lash, in “An Answer to a second scandalous book that Mr. Bisset is now writing, to be published as soon as possible.” Dr. White | Kennel’s celebrated sermon on the death of the first duke of Devonshire, occasioned, amongst many other publications, a jeu d’esprit of Dr. King-, under the title of “An Answer to Clemens Alexandrinus’s Sermon upon * Quis Dives salvetur?‘ ’ What rich man can be saved‘ proving it easy for a camel to get through the eye of a needle.” In 1711, Dr. King very diligently employed his pen in publishing that very useful book for schools, his “Historical account of the Heathen Gods and Heroes, necessary for the understanding of the ancient Poets;” a work still in great esteem, and of which there have been several editions. About the same time he translated “Political considerations upon Refined Politics, and the Master-strokes of State, as practised by the Ancients and Moderns, written by Gabriel Naude, and inscribed to the cardinal Bagni.” At the same period also he employed himself on “Rufinus, or an historical essay on the Favourite Ministry under Theodosius and his son Arcadius with a poem annexed, called ’ Rufinus, or the Favourite.” These were written early in 1711, but not printed till the end of that year. They were levelled against the duke of Marlborough and his adherents and were written with much asperity. Towards the close of 1711 his circumstances began to reassume a favourable aspect and he was recommended by his firm friend Swift to an office under government. “I have settled Dr. King,” says that great writer, “in the Gazette; it will be worth two hundred pounds a year to him. To-morrow I am to carry him to dine with the secretary.” And in another letter, he tells the archbishop of Dublin, “I have got poor Dr. King, who was some time in Ireland, to be gazetteer; which will be worth two hundred and fifty pounds per annum to him, if he be diligent and sober, for which I am engaged. 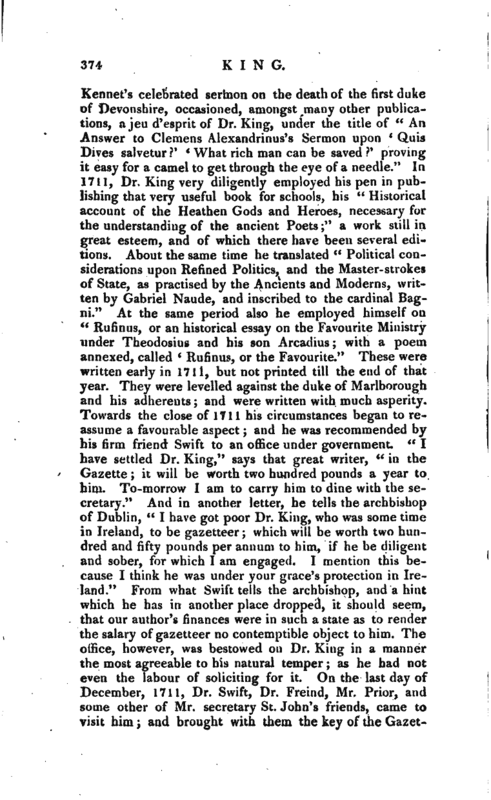 I mention this because I think he was under your grace’s protection in Ireland.” From what Swift te,lls the archbishop, and a hint which he has in another place dropped, it should seem, that our author’s finances were in such a state as to render the salary of gazetteer no contemptible object to him. The office, however, was bestowed on Dr. King in a manner the most agreeable to his natural temper; as he had not even the labour of soliciting for it. On the last day of December, 1711, Dr. Swift, Dr. Freind, Mr. Prior, and some other of Mr. secretary St. John’s friends, came to visit him; and brought with them the key of the | Gazetteer’s office, and another key for the use of the paper-office, which had just before been made the receptacle of a curious collection of mummery, far different from the other contents of that invaluable repository. On the first of January our author had the honour of dining with the secretary; and of thanking him for his remembrance of him at a time when he had almost forgotten himself. He entered on his office the same day; but the extraordinary trouble he met with in discharging its duties proved greater than he could long endure. 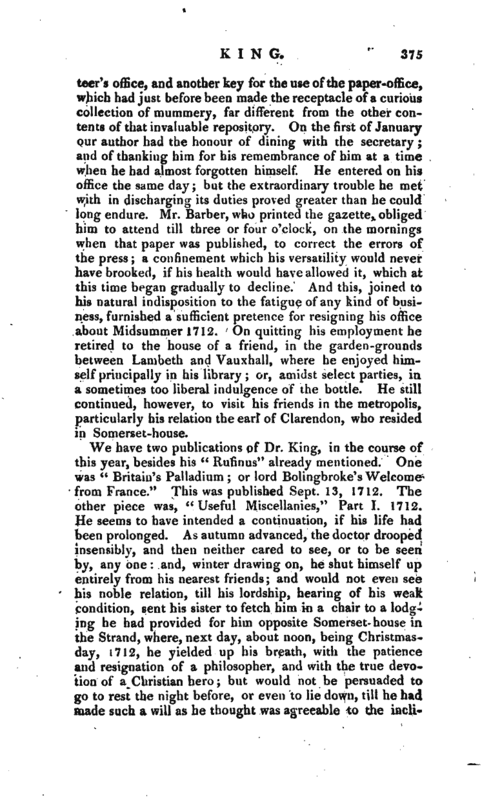 Mr. Barber, who printed the gazette, obliged him to attend till three or four o’clock, on the mornings when that paper was published, to correct the errors of the press; a confinement which his versatility would never have brooked, if his health would have allowed it, which at this time began gradually to decline. And this, joined to his natural indisposition to the fatigue of any kind of business, furnished a sufficient pretence for resigning his office about Midsummer 1712. On quitting his employment he retired to the house of a friend, in the garden-grounds between Lambeth and Vauxhall, where he enjoyed himself principally in his library; or, amidst select parties, in a sometimes too liberal indulgence of the bottle. He still continued, however, to visit his friends in the metropolis, particularly his relation the earl of Clarendon, who resided in Somerset-house. 1 Life prefixed to Mr. Nichols’s edition of his works. Biog. Brit. Coote’s Catalogue of Civilians.